If you’ve got plenty of time on your hands, the Wire Fox Terrier is a wonderful companion. If you are busy, this isn’t the breed for you because, though utterly charming, Wire Fox Terriers require constant attention. This energetic dog originated in England in the mid-1800s where they were hunting dogs skilled at ‘bolting’ foxes and other game out of hiding. Their athleticism allowed them to keep up with horses and the larger hounds with ease. Because their prey drive remains strong, they aren’t good housemates for other pets and must be kept on a leash outside. The dapper breed's wire coat is tough and said to resemble coconut matting made from the fiber of coconut husks. Wire Fox Terriers are beloved for their intelligence and friendly, enthusiastic personalities. They are self-assured, brave, and inquisitive; this is a breed that embodies the maxim carpe diem. Wire Fox Terriers are thought to be a touch livelier than their close relative, the Smooth Fox Terrier. Wire Fox Terriers are also called the Wire Hair Fox Terrier, Wirehaired Terrier, Fox Terrier, and Foxy for short. Coat - Wire Fox Terriers have a dense, wiry double coat that resembles coconut matting. The stiff, short hair grows densely and twists around itself so it’s difficult to part the coat to see the skin. The undercoat is fine and soft. The coat may be crinkly, but is never curly. The hair on the face creates a bold outline, without a significant beard. The coat color is predominantly white mixed with any other color, except brindle, red, liver, or slate blue. Beyond their distinctive coat, a keen expression and agile movements are the primary characteristics of the Wire Fox Terrier. Their ears, which fold neatly at the top, enhance their curious, attentive demeanor. Foxies are graceful and quick, always ready to play or give chase. They have a well-balanced, rectangular frame that is muscular through the neck and legs. Their high-set tail is docked at three-quarters according to the breed standard. Their gate is strong and confident, with a forward driving action that gets most of its power from the hindquarters. Fox Terriers, both the smooth and wire varieties, originated in England in the late 18th century when fox hunting was a favorite sport among aristocrats. The job of the terrier was to ‘bolt’ the fox out from hiding so the hunters on horseback and hounds on the ground could chase the fox. The mostly white coloring of the Fox Terrier was important so they would never be mistaken for the fox in the field. The Wire Fox Terrier became a distinct breed from the Smooth Fox Terrier variety through crossbreeding with rough-coated Welsh Black and Tan Terriers. The American Kennel Club recognized Fox Terriers in 1885, and later split them into the two distinct breeds. Wire Fox Terriers are bright-eyed, lively, and alert. They are independent spirits, always in pursuit of adventure. They can get into mischief when given too much leeway to fend for themselves, but if kept busy they make playful and charming company. They can be somewhat standoffish with people they don’t know, and may be aggressive with new dogs they encounter. Socialization and training are important to keep these unwanted tendencies in check. Are Wire Fox Terriers Good with Kids? Wire Fox Terriers are too rambunctious for small kids, but they get along with older children swimmingly. Make sure your children know how to play with a dog respectfully, and that they can manage your Foxy on leash before giving them the responsibility of walks. Are Wire Fox Terriers Good with Other Pets? Wire Fox Terriers are hunters by nature, so they won’t live peacefully with small animals or cats. They may be able to live with another dog if they are socialized with them from an early age, but they prefer being the only canine of the castle. Wire Fox Terriers are protective of their people, themselves, and their territory. Are Wire Fox Terriers Good Guard Dogs? Wire Fox Terriers are watchful and noisy when needed. They will let you know if someone is approaching the house—welcome or otherwise. They won’t back down if someone poses a threat, but are not burly enough to be intimidating. Wire Fox Terriers are very energetic dogs who require a lot of activity, exercise, and interaction every day. Wire Fox Terriers are frequent barkers, no matter how much you try to train out this trait. They shouldn’t be left alone with other pets. They are too energetic to play with young children. Always walk them on leash because they will chase the first squirrel they see. They can be scrappy with other dogs. They require experienced owners who set firm, consistent boundaries, and have time to exercise with them. If your yard isn't secured like Fort Knox, your Fox Terrier will find a way out by digging or jumping. They’re prone to destructive behaviors and nuisance barking when they get bored. The Wire Fox Terrier coat requires clipping or stripping, in addition to regular brushing. Indoor Wire Fox Terriers should live inside with their families. They can take some time to housetrain, so expect messes when they first come home with you. Crate training can help manage accidents. Outdoor This breed does best when given ample time to cavort outdoors, playing catch, walking, and running. An enclosed yard is also ideal, so you can take them outside when they get antsy. Don’t leave them outside on their own for very long, because they will start barking and searching for an escape route—or digging one themselves. ExerciseA healthy Wire Fox Terrier requires between one and two hours of physical activity each day to remain fit. They are athletic and do well in dog sports of most varieties. Endurance Wire Fox Terriers have the stamina for long play sessions and walks. Running Miles: Healthy, adult Wire Fox Terriers will run with you for three to five miles. They make excellent exercise partners for running and biking. Hiking Miles: Healthy Wire Fox Terriers can easily manage a five- to seven-mile hike. Make sure your Foxy is thoroughly leash trained or they’ll be chasing after every chipmunk and blowing leaf. Food Generally, this breed requires about 1½ to 2 cups of good quality dry dog food each day given in two feedings. This will vary, however, based upon your Wire Fox Terrier’s activity level and age. Talk to your veterinarian about the optimal diet and quantity of food for your Foxy. Alone Time Wire Fox Terriers can spend time alone for a few hours each day, but they will turn to destructive behaviors if it drags on too long. Crate training can help minimize damage. Just make sure they are comfortable in their den, and have their favorite toys in the dog crate with them. If you are entering your Wire Fox Terrier in conformation contests, their coats will require a great deal of attention to keep in show-ready shape. Mainly, their wire coats need to be stripped regularly by you or by a professional groomer. If your Foxy is a companion exclusively, you can have him clipped instead of stripped. Keep in mind, clipping softens the Wire Fox Terrier’s harsh coat over time. Brush your Foxy a few days a week, making sure to brush out knots and tangles that may form in their beard and in the feathering on their legs. A bath once a month, or when they get dirty, will suffice to keep their coat healthy. Wash your Foxy’s ears weekly with a gentle, dog-friendly cleanser to prevent dirt buildup that can cause infections. Brush your Wire Fox Terrier’s teeth several times a week, and trim their nails every month or so to prevent cracking. 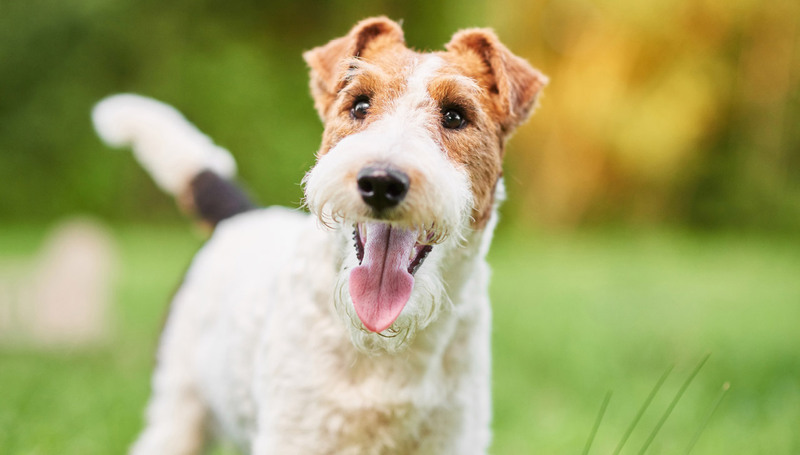 You can minimize serious health concerns in a Wire Fox Terrier by purchasing from a reputable breeder who engages in responsible breeding practices, and through screening for common diseases and conditions. Wire Fox Terriers are smart and eager to please, so they can pick up the basics with ease. They get bored easily, however, so it's important to keep training sessions fun, challenging, and short. Foxies are known to take their time with housetraining. Offer plenty of positive reinforcement and dog treats when training, and, above all, be patient. Continued training is a wise way to keep your Wire Fox Terrier active and engaged. They will enjoy advanced training in obedience, agility, and dog sports. The breed is also a natural in Earthdog trials, where dogs test their skills finding small animals going 'to ground' in their burrows. Wire Fox Terriers still put their natural abilities to work in fox hunting. Are Wire Fox Terriers hypoallergenic? The Wire Fox Terrier is often listed among hypoallergenic breeds. Keep in mind, however, that this is a double coated breed that sheds and leaves behind pet dander, which is the primary source of pet-related allergies. It’s possible the Fox Terrier’s wiry coat doesn’t shed as readily because of its dense ‘coconut matting’ texture, and as a result, it has gained a reputation as hypoallergenic. No dog is 100 percent hypoallergenic. Do Wire Fox Terriers bark a lot? These dogs are notorious barkers — at the mailperson, at the neighbor's cat, at a blowing leaf. Your Wire Fox Terrier will let you know someone or something is on the move. Additionally, Wire Fox Terriers are prone to nuisance barking when they become bored. Do Wire Fox Terriers like to swim? Wire Fox Terriers can learn to swim and many of them enjoy cooling off in the water in summertime. If they enjoy swimming, it's a great form of exercise for the breed. Just like people, dogs are unique in their likes and dislikes, so introduce your Foxy to the water slowly and don't force it. All dogs should be watched closely while swimming.